The interior was dark, rich and vibrant; it was easy to forget I was in the middle of a strip mall off a busy road. I instantly understood why customers spend so much time here. It was a calm sanctuary in the middle of a busy day. The clerk behind the counter welcomed me in and asked if I needed any assistance. I replied "Yes, actually I have an appointment with Tom." The clerk nodded his head and said "Sure, one moment." Now, you may be wondering, with all the aromas filling the air, if this is a spa or if Tom is a masseuse. I can readily assure you no, neither of those. This was actually a business call. Presently, Tom (or at least, a man I assumed to be Tom) walked up from the back, and with a large grin, shot out his hand at me and thanked me for coming. "I'm glad you could make it on such short notice. I've been worried what our customers would think if they saw the carpet I told you about." "It's a good thing they haven't, yet." I replied. "Yes, I had to move one of our cabinets to cover the mold stain on the floor." I instinctively winced at the word "mold". Unless it's in cheese or specialty beer, mold is never a good thing. We walked down the hallway and he opened a door on the left. We walked in. From floor to ceiling, wall to wall, there was nothing but thick mahogany cabinets, each lined with Spanish cedar and fronted with clear glass. "There must be thousands of cigars in here!" I exclaimed. "Over 10,000, although it does change often," said Tom. The soft, warm lighting accentuated the deep hues of the mahogany paneling on the walls. Row after row of cigars of all ring sizes were displayed in those great cabinets, and in all colors from double claros to oscuros. Off in one corner of the room, I saw thick clouds of white vapor pouring from behind a cabinet. But this cloud wasn't from a customer puffing away on a stogie; no, it was the humidifier used to keep the humidity level near 70%. The portable humidifier was off-white color, rather dirty, and looked terribly out of place in a room of such fine quality. It was the reason Tom had called us the day before. He had bought it a year ago as a stop-gap; a temporary measure to control the humidity before he could find a better solution. One thing led to another, time wore on, and with the exception of filling it with water in the winter, he mostly forgot about it. But his customers never forgot about it. Expecting to feel like royalty when they entered their smokers' sancuary, the cheap humidifier humming away in the corner stood out like a cracked Cuban in a box of Habanos. It's hard to quantify how much this cheap humidifier is costing his business. It's easy to figure how much electricity it's wasting, but let's get real, that is chump change compared to the money he is losing from negative customer goodwill and damaged merchandise. Tom told me he has lost thousands of dollars of cigars because the room was too dry and they cracked, or too humid and... well... the tobacco beetles paid a visit. Certainly, Tom's operation is a very nice one, and his customers are discerning, so he would never try to pass off damaged product. He simply had to throw it away. Tom's store bought humidifier was actually a very "high end" model. It had several output settings and claimed to have a humidistat--a sensor that measures humidity, like a thermometer measures temperature. So the fact that he had severe problems goes to show there is more to conditioning your shop than meets the eye. Consumer humidifiers, even those with humidity sensors, are notorious for having poor controls. The sensor, if equipped, is a very rough guage of the humidity level. It has a wide range of accuracy, which does not work well with tobacco. But in Tom's specific case, the discharge of the humidifier was a poor design which allowed drops of water, too heavy to be effective, to escape and immediately fall to the ground. That water obviously was not going to humidify the air, and it began to create a moist environment in the carpet in which mold could grow. So, as a tobacco store owner/operator, or the (lucky) owner of a walk in humidor, what can you do to control humidity? First, you need to understand how your HVAC system works. In short, as warm air passes over the cooling coil, the coil absorbs heat. Because the cooling coil is cold, some of the moisture in the passing warm air condenses and is drained out as liquid water, condensation. It's the same phenomenon as a cold glass of iced tea on a warm summer day. The outside of the glass gets wet. The bad part of it this is, however, that the moisture that was in the air allowing your tobacco to store properly is literally running down the drain. Over time, the humidity levels in your humidor will drop. And here's the surprising part: The better the humidor, the more the humidity drops! Why is that? Because the best humidors have very tight construction, and won't allow outside moisture to migrate into the space. So any moisture your HVAC unit wrings out of the air will not be replaced. That means when it comes to humidity levels, you have to supplement with a humidifier! Moisture will migrate into-and out of-your humidor through the walls, ceiling, floor, cracks, doors, etc. Your HVAC unit will strip moisture out of your humidor. 95% or more of humidor owners will need to supplement humidity levels by using a humidifier. Don't be like Tom and learn the hard way! Don't buy a cheap humidifier from a big-box store, only to be disappointed a few months later. At MonMan, we have 20 years of experience in critical environments like: data centers, high-tech labs, pharmaceutical manufacturing plants and more. And yes, we consider the tobacco industry to be a very critical environment! 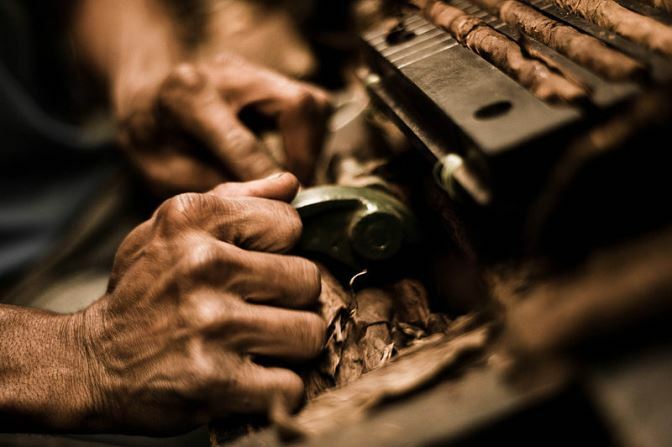 We have worked with tobacconists across the country and around the world to help them fix their humidity problems! Contact us today to see how we can help you. Due to their high efficiency, superb cleanliness and precise humidity control, we only recommend ultrasonic humidifiers for cigar shops. There are several configurations available to suit your needs, but the operation remains the same: Small transducers sit below a water trough and vibrate the water at a frequency too high for humans to hear. The vibrations literally energize the water so much the bonds holding the larger water drops together are broken, allowing the water to escape as a very fine mist only a few microns in diameter. This is not steam, it's not hot, and it doesn't feel wet on your hands! When you contact us, we will work with you through a site evaluation and checklist to determine which configuration will provide the best results. We have standalone, wall mounted humidifiers that can be mounted directly inside your humidor. Many customers prefer the metal finish version, which compliments the elegance of a cigar shop or humidor. If space is limited in the room, or you want the ultimate in integration, MonMan has ducted humidifiers that can belocated outside the space and ducted into the room. The humidifier will never be seen or heard. All your customers will know is that your humidor is always at the perfect temperature and humidity. and they prefer to buy from you because you obviously know what it takes to be a professional. Regardless of the configuration of the humidifier (ducted vs. wall mounted), the unit can have a hardwired electrical connection, as well as a permanent water supply line. We prefer to specify a water supply valve, which allows precise filling of the unit, preventing overflow or unit damage due to low water levels. So if your cigar shop or humidor is struggling to maintain the proper humidity level, or if the humidity level won't hold steady, give us a call or send an email. We will work with you to provide a design and a commercial/industrial grade humidifier that will save you money, and protect your product before you have problems. The good news for Tom is that he reached out to us in time for winter, and he never had a humidity problem again. After installing one of our humidifiers in his humidor, he got that warm fuzzy feeling back. And this time, it wasn't from the mold in the carpet! Contact us today to discuss, or keep reading and learn more. Awesome picture and a nice story. Insane to think that some shop owners will allow mold to grow so close to their merchandise. Unbelieveable. Looks like you have high end humidifiers that aren't your average tub of moisture gel.